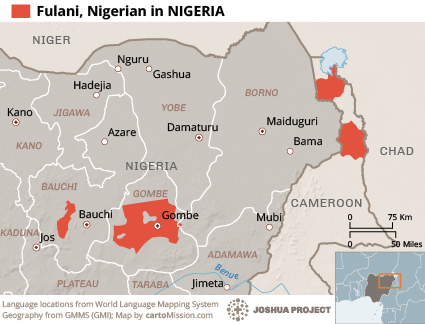 This people group includes the marauding murdering bandits that terrorise mainly Christian towns and villages in Northern and Middle Nigeria-do pray for them! 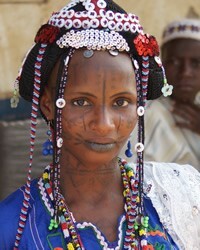 Scattered mostly in Nigeria and Cameroon, these semi-nomadic people fiercely reject anything they perceive as contrary to their lifestyle of roaming with their cattle herds. This includes education, (they are mostly illiterate), and permanent homes. They are widely regarded as troublesome impediments to the large cattle ranchers. One businessman and member of a ruling party has established two large cattle ranches, forcing the Mbororo tribal people from their historic grazing land. They were given no compensation. Their illiteracy and intense independence have placed them on unequal footing with greedy people like these who take advantage of them. Illiteracy is an obstacle to learning about Christ if the Gospel comes to them only in printed form. Christians need to be genuinely concerned about the material welfare of the Mbororo people, finding ways to assist them, building friendships and trust. Pray the few Christian believers among the Mbororo people will be sent teachers to help them become well established in the faith. Pray they will find each other in order to fellowship together. Pray they will learn to live in the power of Christ’s Spirit, experiencing the fruit of Christ’s Spirit consistently. Pray the Mborro tribe will be able to care adequately for their families, and be led to be better prepared for the rapidly changing conditions of the 21st century. Pray they will see the need to make schooling a priority for their children. ← Encouraging news from MERF about work among Muslims.